Ask Her Friends Bloggers' Panel…and Win A £50 Voucher! Have you heard about askherfriends.com? The site takes the hassle out of finding gifts for her; there’s an ideas map you can populate with info about her style and hobbies, advice from expert advisers and, of course, the chance to literally ask her friends for their suggestions. A monthly blogger's panel helps compile suggestions – and this month, I’m helping out with mine. 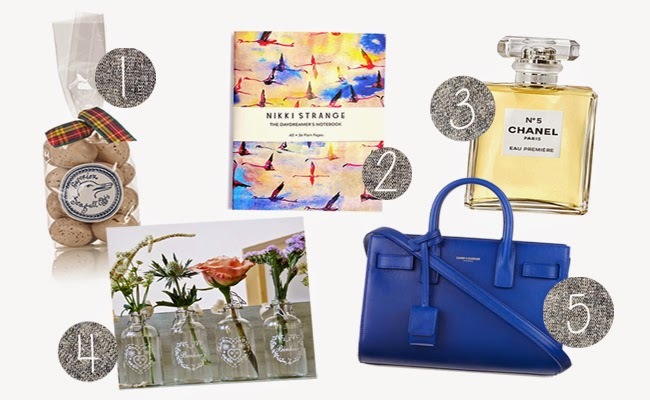 I’ve picked these favourites from the site's wide range of beauty, fashion, homeware and experiential gifts – there’s lots for every budget, which I’ve reflected in my picks. They’re also offering you guys a chance to win a £50 voucher from the site – just head on over and vote for your favourite suggestions. So what have I picked out, then? ONE: Salted Caramel Eggs by Rococo Chocolate; I don’t have a sweet tooth generally, but salted caramel? Wibble. TWO: Pink Flamingo Flight A5 Notebook by Nikki Strange; I have a notebook obsession as I make countless, endless lists; this kitsch print is to die for. THREE: Chanel No.5 Eau Premiere; I’m a die-hard fan of the original but also love this soft, fresh take on the classic scent. FOUR: Set Of Four Vintage Country Bottles With Hearts by The Wedding of my Dreams; my sister is getting married and wants a vintage, country-fete vibe. These would be perfect. FIVE: Saint Laurent Mini Sac De Jour Tote Bag by The Collection; because a girl can dream! If you win that voucher, I’ll gladly take any or all of this little lot off your hands! Anything catching your eye?